A easy and tasty cake recipe to celebrate this Christmas this time in my blog. I thought of trying an egg less fruit cake but due to some personal commitments, I was not able to do. So, I planned to post a simple dates cake this time. Something is better than nothing. :-) Am I right? 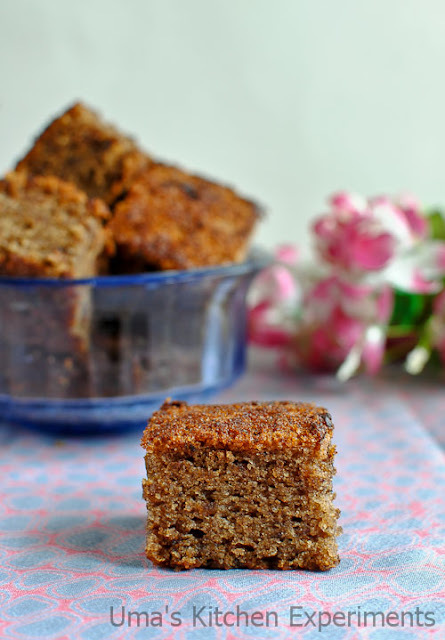 I have bookmarked many recipes to try from Prathibha's blog and this cake is one of them. 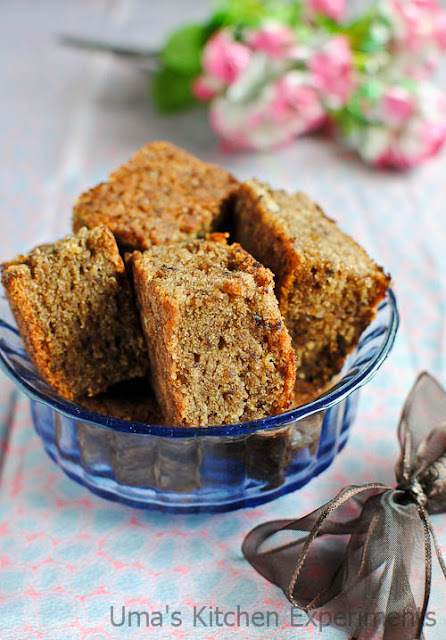 She has many cakes and bakes in her blog and also many traditional recipes. 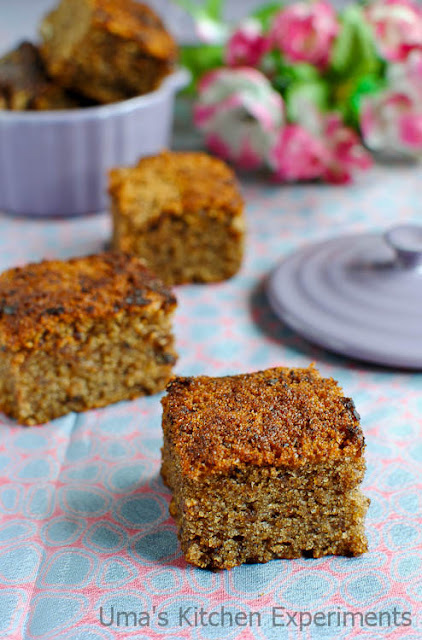 If you have time, please visit her blog and enjoy the recipes. 1) Sift together the flour, baking soda one or two times for even mixing. 2) Warm the milk and soak the dates in it for 10-15 minutes. I kept aside till the milk reaches the room temperature. 3) Preheat the oven to 180C/360F for 10-15 minutes. Grease the round/ square baking tray with butter and dust it with flour. Keep it aside. 4) In a mixing bowl, mix oil, milk(1/2 cup and remaining 1/4 cup I used to grind the dates) and sugar. 5) Make a paste of the dates using a blender or food processor. I used only 1/4 of milk for easy grinding. Add this ground dates to the wet ingredients. Mix well till you get smooth thin batter. 6) Add the flour mixture to it and gently fold it till all the ingredients are properly mixed. 7) Add roughly chopped roasted walnuts to the batter. Gently fold it. 8) Pour this batter to the prepared pan and bake it for 30-35 minutes. After 30 minutes, check it with bamboo skewer by inserting it into the center of the cake. It should come out clean. My cake was done in 25 minutes itself. So keep on eye after 20 minutes. The baking time might vary from oven to oven. 9) Cool the cake for 5-10 minutes and transfer it to wire rock to cool completely. 10) Cut them into slices and enjoy with ice cream. 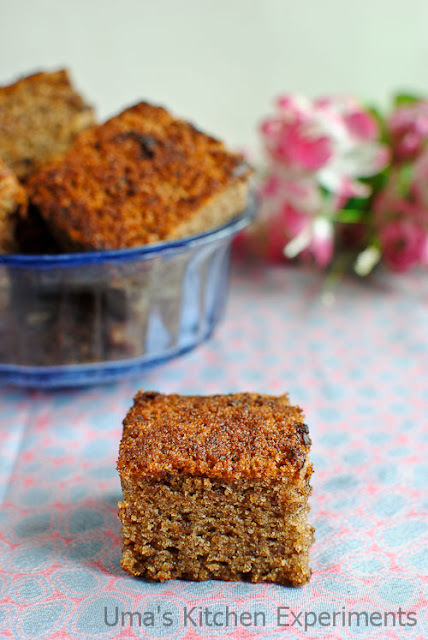 1) Depends upon the colour and quality of the dates, the colour of the cake will vary. I used ordinary brown seedless dates for this cake. You can also use black dates for this cake. 2) Use any nuts whichever available at your pantry. 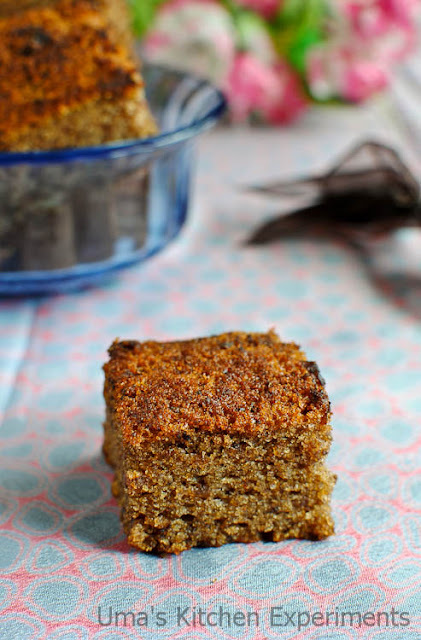 3) You can also use brown sugar instead of white granulated sugar for this cake. 4) I added only 1/2 cup of sugar considering the sweetness in the dates. I find it enough. If you need more sweetness, then add 3/4 cup as said in the recipe. Cake looks delicious, Merry christmas. Merry Christmas Uma. Cake looks delicious. love tis delicious looking cake..
@ Yesha, It is 180C.